What did Farrah Abraham give her child? 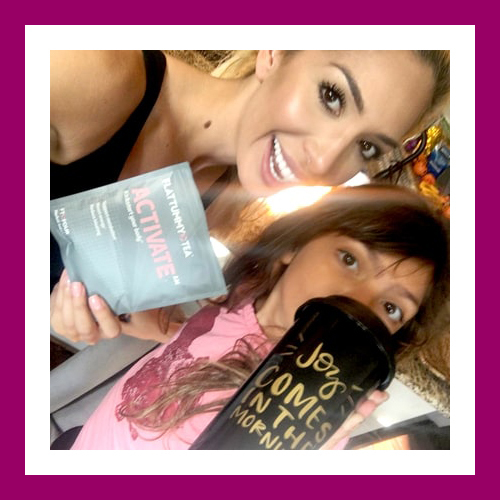 Farrah Abraham caused a storm this week by posting a picture of her 7-year-old daughter drinking detox tea. Immediately there was a backlash from all the super-moms across America. These are the ones who feel that they and they alone know how to raise a child. Anyone differing from their stance in child rearing should be burned at the stake. I’m perfectly sure that Farrah would not intentionally give her child anything that would harm her. While I agree, there are many products out there claiming to make you walk on water. It was strawberry milk the child was drinking. Which is a lot healthier than the sugar or artificial colour loaded fizzy drinks some of these super mothers feed their children daily. To Farrah I have this to say: I doubt very much if you would put your child in danger. Let alone in front of the nation with a product that has not been cleared as healthy. You have raised her quite well for 7 years without their help and I’m sure you are doing a wonderful job. If this picture served one purpose, it proved that they are paying attention. Possibly reading your story while their kids are raiding the fizzy drinks in the fridge. So, let it go over your head Farrah and continue being a good Mother. Let’s throw out a few cards for you Farrah Abraham and see what lies ahead. This is the business card. I’m aware that Sophia has already started modelling children’s fashion and has a children’s boutique named after her. This card points to business within your close circle which would be family. It’s possible the teen Sophia could turn to modelling as a career because of this. However, keeping her childhood carefree is vital. This is her learning phase in life. It’s not just the body that needs to grow, but the mind needs to evolve at its own pace. This is the emotional card. Again, it’s a three which in this case generally means the family unit and the closeness within. Though others may not agree with your methods, you know what is good for your child. No child comes with an instruction book and no two children are the same. The relationship between you and Sophia is very close almost like friends. This is something that will only get stronger in time. Again, this is a financial card. Here we see something that started small grow into something larger. It’s quite possible the children’s fashion line is going to grow larger than you thought. As Sophie becomes a teen, she will bring her own tastes and touches to things. Some you won’t agree with but that has been the argument of generations upon generations. These cards point to growth in family and business. There is every possibility that Sophia will go on to grow the fashion business. You appear to have given her a good start to what could potentially be a fantastic career. For now, it would appear childhood should not be disturbed by the things of adulthood. Some of our best memories of childhood are getting dirty and making a mess. I’m looking to mid-summer 2017. There appears to be a reason for your heart to miss a beat in the best possible way. This isn’t about your child. It’s about you and love in your life. Previous ArticleWhy does Ben Higgins of “The Batchelor’s” feel left out?Next ArticleWhat message has Miranda Kerr got for broken hearts?